Scads of Common Sunflower, Helianthus annuus, brighten a large field just north of Yellow Springs, Ohio. Every fall I see people posting photos of this field, which is owned and planted by the Tecumseh Land Trust, or other such fields. And every year, I fail to make it over to this or any other sunflower field. 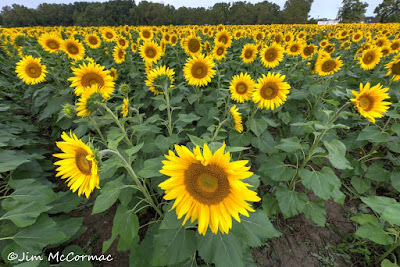 I met fellow photographer Debbie DiCarlo at the Tecumseh Land Trust field at the crack of dawn, and set about creating images of the golden masses of sunflowers. This species normally towers to epic Jack-in-the-beanstalk proportions, often ten feet or more in height. They must have a stubby cultivar now, as these plants rose to only 4-5 feet or so, making the creation of images much easier. Anyway, Debbie and I are thinking of partnering to conduct some photographic workshops and trips next year, and ostensibly met today to discuss those. But the sunflower field ended up occupying about three hours of time, and it was worth every minute. Anyway, more on the photo workshops in the future, but they'll all feature very interesting subject matter and locations, and it'll be a pleasure to work with Debbie as she's a fabulous photographer. Check her out HERE. Zoom lenses are great tools for creating photographic weirdness, and I spent much of my time experimenting with two Canon lenses: the 16-35mm f/4, and the 70-200mm f/2.8 II. By using long exposures and twisting the zoom while the shutter is open, one can create some cool (at least to me) blurred distortion shots. This one was done by using a long exposure and moving the camera horizontally on its tripod mount while the shutter was open. In order to achieve long exposures in fairly bright conditions, I used a three-stop polarizing filter, and a ten-stop filter. The latter is a "black glass" filter that is so dark that you must focus the camera prior to mounting it, as the camera cannot focus through it. That filter allowed me to get up to a 30 second exposure, depending on my aperture and ISO settings. Another "explosion blur" using the 16-35 lens and zooming from 16mm to 35mm with the shutter open. This one was made with the 70-200mm, using an eight second shutter speed at f/4 (with the ten-stop filter), and zooming completely in and out multiple times during the exposure. While this style of imagery may not be everyone's cup of tea, it does allow for an alternative presentation of a landscape that everyone is generally shooting about the same same way.